This simple jaw and spider coupling features a nitrile rubber element between the two sintered aluminum hubs. Using aluminum in the hubs decreases moment of inertia on starts and stops. 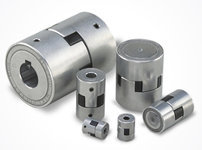 AL couplings are available in standard bore sizes with key and setscrew, or pilot bore. Bores may also be machined to customer specifications upon request.